Welcome to Payal’s Cooking School. 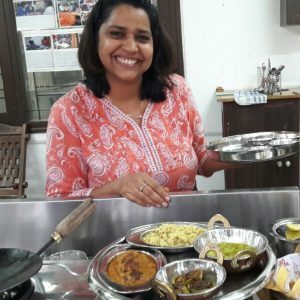 This website is an outcome of five years of my research about Indian food, and my first hand experience in doing Indian Cooking classes with people from all over the world. It took me 35 years of my life to actually come out of my under-confident personality and do something that I truely love. The fear of Failure kept me away from my passion. School days got over with many many failures in competitive exams in different streams and financial constraints kept me away from admission to a professional Cooking course. Life went on and I became mother of two children, again staying at home became my priority. But I still longed to do something for myself and also to support financially our family. Ideas didn’t pour in actually, I did a thorough research for starting a home business trying to figure out what is best for me. One thing that always bothered me was that in today’s world people see no need to Cook, yet they all talked about health and healthy food. I was unable to understand how ‘Health’ is different from eating a home cooked meal. How can we have numerous food theories, discussion about ‘Good’ & ‘Bad’ food, if we rely on buying cooked food all the time. So initially a thought about doing Cooking Classes crossed my mind. But with research I understood that unfortunately now people of India don’t want to learn about their own food, rather they wish to learn cuisines of other cultures. I felt the importance of our cuisine and food in our own country was at its all time low… The hurdle of that fact kept me away from my dream project till I figured out that I should open up a Bed & Breakfast for foreign tourist and also open share my countries rich culture. And thus came my own business idea into a reality. With Financial support of few good friends I started my own Cooking School and a Guest house. With little investment and lot of support from my husband I fianlly began journey. I made two websites http://www.sriharabednbreakfast.com and http://www.jaipurhomecooking.com completely by myself and took up all promotion with my own knowledge and skill. Though in the recent decades, I felt, cooking become just a hobby even in India too. But it is still a little better situation as sooner or later we Indians start missing home cooked meals. In today’s high stress life, cooking is no more considered as an essential part of our day to day life, though food is still there!! Buying fresh ingredients become more costly and time consuming than ordering favorite food from your phone. Cooking lost its importance in our homes just so silently, that we forgot it is a basic need and a life survival skill. I can not imagine how people spend more than half of their lives eating food cooked in a take away OR worse, eating pre-cooked frozen meals. Eating is a ritual, it is the most sacred time of the day. It is a time of full consciousness and mindfulness, and rather it has become the least important time of the whole day. I wish to revoke the fulfillment of cooking & eating in the lives of everyone. Thus with my cooking school, I wish I can bring some change in the way people see food… and become more connected to the most sacred gift of nature. You can check our Indian cooking classes details on the Menu and also our B&B accommodation in Jaipur. If you like us- Share with your friends & family. Your questions and suggestions are most welcome.